The following documents and associated resources have been developed with the support and advice of many community agencies across Alberta. Many of the resources have been adapted from Mentoring Immigrant and Refugee Youth: A Toolkit for Program Coordinators. They are intended to support community-based groups and organizations that are striving to develop and deliver quality mentoring programs to children and youth who are new to Canada. The tools are based upon research and the combined expertise of those who are already doing this important work. For years, Canada has been home to thousands of refugees, immigrants, and newcomers from around the world. Most recently, the largest influx of newcomers have been Syrian refugees displaced from conflict. As of January 29th, 2017, Canada has welcomed 40,081 Syrian refugees. This is not the first time, and sadly, it likely won’t be the last that those fleeing conflict or strife will need to find a new home. Mentoring is the simple act of an adult or older individual spending dedicated time with a younger person. By creating a relationship based on trust and open communication, mentors help kids foster a sense of belonging, build self-confidence and learn new skills and passions. Talking and spending time with engaged adults provides children with positive experiences during periods of heightened brain development. 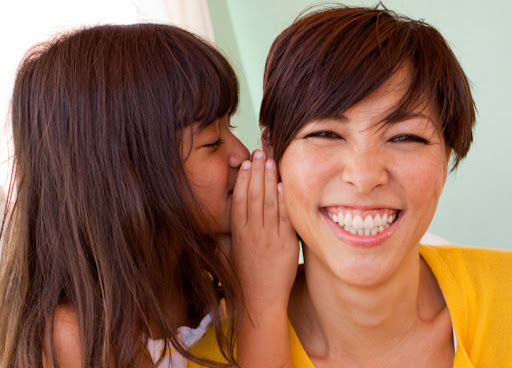 That kind of positive mentoring can help children build a solid foundation that prepares them to adapt to the future demands of the adult world. Mentoring for refugee, immigrant & newcomer children and youth helps them succeed in school, and adjust to their new home. Spending time with a young person may seem simple, but science tells us that healthy interactions with supportive adults boosts children’s brain development, mental health, and well-being. This is even more important in helping youth who are transitioning from a new country or culture. We know that refugee, immigrant & newcomer children and youth are in need of unique supports and interventions. Establishing strong mentoring relationships can help a young person thrive, and in turn have a positive impact on the whole family. Whether you are working with Syrian refugee youth who have recently arrived, or more established communities, there are universal practices and considerations outlined below that will maximize your impact. Consider these best practices, success, and challenges as you get started, or as you rework your current program. Mentoring refugee and newcomer youth is an enriching experience, for both the mentor and participant. If you click the link above (Download all the Resources), you will receive a .zip file that includes the main document, Mentoring Refugee, Immigrant & Newcomer Children and Youth, along with six further resources also linked below. 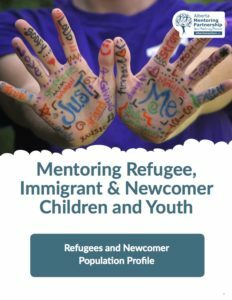 The Mentoring Refugee, Immigrant & Newcomer Children and Youth Resource is split into 9 resources — see below for an introduction to each resource and which page they can be found in the main document. The following document and associated resources have been developed with the support and advice of many community agencies across Alberta. 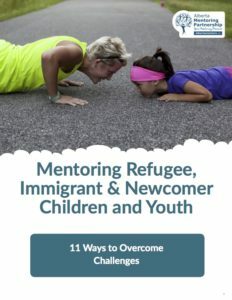 Many of the resources have been adapted from Mentoring Immigrant and Refugee Youth: A Toolkit for Program Coordinators . They are intended to support community-based groups and organizations that are striving to develop and deliver quality mentoring programs to children and youth who are new to Canada. The tools are based upon research and the combined expertise of those who are already doing this important work. Canada, and Alberta in particular, is a multicultural place. Every year, we welcome New Canadians – be they immigrants or refugees. Many New Canadians face challenges when they arrive – language barriers, gaps in their education, cultural adjustments. It is increasingly important that community groups and organizations develop programs to effectively support these members of our communities. Introducing, or in many cases formalizing, the practice of mentoring for New Canadians is an important part of addressing many of the challenges that these youth face as they grow up. 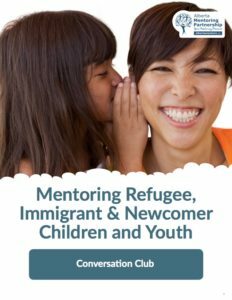 To support the development of a mentoring program with newcomer and refugee children, it is important to be open and understanding – to listen, learn and adapt to meet the needs and preferences of the particular community you hope to work with. A culturally relevant approach is necessary for making a connection with youth. These considerations frame the tools and resources on the AMP website for mentoring newcomer and refugee youth. They provide specific resources to support your work with diverse communities, supporting the development and implementation of quality mentoring programs that foster strength and resilience. A newcomer is an immigrant or refugee who has been in Canada for a short time, usually less than 3 or 5 years. Newcomers have access to lots of services at settlement agencies, like language and immigrant help. An immigrant is someone who has moved from their country of origin (their homeland) to another country, for example, Canada, to become a citizen of that country, if they wish to do so. Just visiting a country, even to work for a few months, does not make you an immigrant. Immigrants are people who live permanently somewhere other than their homeland. Refugees and people needing protection are people escaping being persecuted in their homeland. This means that if they stay or return to their homeland, they will risk being tortured, killed, suffer cruel treatment, or worse. Refugees seek protection in safe countries, such as Canada. An undocumented person is a newcomer who has moved from their homeland to another country like Canada to become a citizen. However, undocumented persons are different from documented immigrants because their immigration status is unknown or unofficial. Undocumented persons are also known as: Uninsured person, Sans papier (without papers), non-status, without status. Newcomer and refugee youth may be facing many challenges in addition to language and cultural adjustments. Many of these challenges stem from their home life. Children and communities have much to contribute and can be great assets in helping your program be successful. Whether in a formal or informal way, involving the community will help your program succeed. Some organizations choose to form an advisory board. Others reach out to people and groups at different times in the program planning and implementation. Whichever approach you choose, consider the following groups for involvement and assistance. Programs that are youth-driven and flexible, both in terms of overall scope and day-to-day activities, have received positive reviews and are seen to have the greatest impact. Members of the cultural community are in touch with the needs of the newcomers, and frequently have connections through religious organizations or otherwise. They are well equipped to offer programs quickly and effectively, and to work with you to support participation. 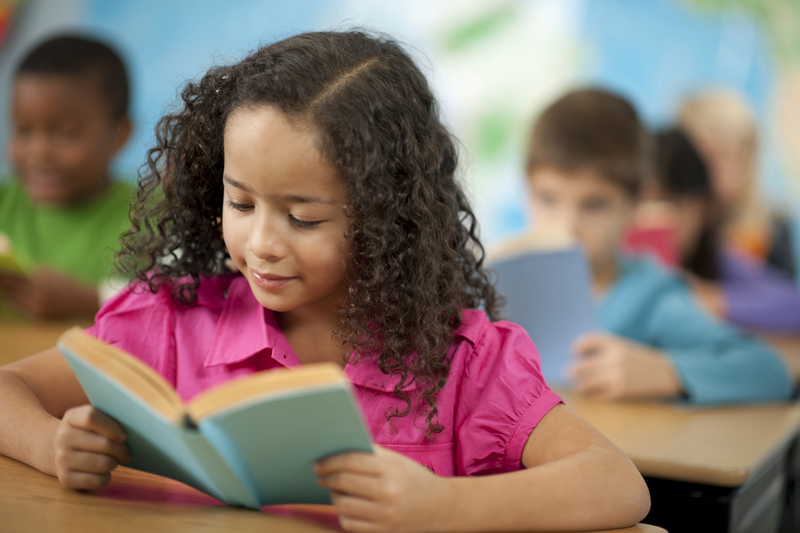 Schools provide a venue, and also create a level of comfort for families. In this regard, they have an advantage in terms of providing mentoring programs; they can also dovetail with existing services and academic programs at the school. Schools and community groups have had success with having peer groups provide mentoring to each other, and with older youth mentoring younger youth. Mentoring is not something only to be done by adults. Having programming available for the whole family at one time encourages participation, creating a comfort level for parents and removing potential barriers such as baby-sitting younger siblings. Mentoring makes a big difference in the lives of students, particularly newcomers and refugees. They may be facing barriers, such as linguistic and cultural adjustments, as well as stress relating to exclusion, poverty, or separation. Refugee students may have had their formal education interrupted, sometimes for several years at a time. Please download the following brochure as a resource to share with schools, or community agencies who have yet to develop a mentoring program. Homework Clubs provide extra support for youth in need, whether they’re facing language barriers, adjustments to new cities or countries, or have other challenges affecting their education. Homework clubs can also have the added benefit of developing a caring relationship between a child and an adult or older individual. By creating a relationship based on trust and open communication, mentors help kids foster a sense of belonging, build self-confidence and learn new skills and passions. Mentoring is proven to help a young person do better in school, understand their strengths, and reach for their goals. Your presence, time, support, advice, friendship and constructive role modelling can make a big difference. 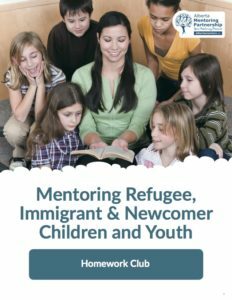 Learn the steps to setting up a Homework Club for your mentoring program by downloading the following resource. A conversation club is a group mentoring exercise. It allows newcomer and refugee youth to learn and practice English, and to learn about local culture. It also offers intercultural learning opportunities, as mentors learn about the culture and customs of participants. Conversation clubs can also have the added benefit of developing a caring relationship between a child and an adult or older individual. By creating a relationship based on trust and open communication, mentors help kids foster a sense of belonging, build self-confidence and learn new skills and passions. Mentoring is proven to help a young person do better in school, understand their strengths, and reach for their goals. Your presence, time, support, advice, friendship and constructive role modelling can make a big difference. Learn more about setting up a Conversation Club for your mentoring program through downloading the following resource.